Trent Edwards completed a remarkably swift fall from grace Monday when the Bills released him. Edwards, who started the first two games of the season for the Bills, is a former third-round draft pick who started 32 games over the past three-plus years for Buffalo. He showed promise in his first two seasons, but his struggles last year caused him to be benched, and this season new head coach Chan Gailey quickly pulled the plug on Edwards. Ryan Fitzpatrick took Edwards’s starting job last week, and now Edwards is without a job completely. Edwards is a big quarterback with a decent arm, and he’s a smart quarterback as well. But he’s never been able to take advantage of deep threat Lee Evans, and the Bills’ offense has lacked passing-game pop. The Bills reportedly turned down offers for Edwards in the offseason, and given the way things have turned out, that was a mistake, because getting even a late-round draft pick for a player who ended up being cut in September would have been a better resolution than this. Edwards is probably better suited as a backup than a starter, but a change of scenery could help. Edwards wasn’t the long-term answer at quarterback in Buffalo, but his absence shows once again that the Bills haven’t been able to find a quarterback of the future since the Jim Kelly era. 10 – Mike Shanahan, Redskins – Shanahan, one of the big-name coaches on the market, seemed to be the most eager one to take a job this year. Most of all, he wanted a job where he would have final decision-making power like he had in Denver. He got that job with the Redskins, where he (not owner Daniel Snyder) will have final say. Shanahan’s hand-picked GM, Bruce Allen, will work on the day-to-day personnel responsibilities. On the field, Shanahan is a terrific offensive mind who knows the West Coast scheme as well as anyone and can implement it. That’ll be the plan, but it will probably take multiple years for him to accumulate the offensive talent to do it. Jason Campbell is OK, but unless Shanahan is sold the Redskins will start over at quarterback, and the offensive line is old and brittle while the receiving corps is young and unproven. There’s more talent on defense, which should help Shanahan lure a big-name defensive coordinator, although keeping Greg Blache would be acceptable as well. Shanahan had lost steam with the Broncos at the end of his tenure there, and it’ll be interesting to see whether a new spot reinvigorates him. The questions, however, fall more on the personnel side than the coaching side with him. If he can find the offensive talent, he should be able to build a winner in Washington. 7 – Pete Carroll, Seahawks – Carroll built a powerhouse at USC, putting together big talent on the field, finding up-and-coming coaches, and creating a culture of excellence and competition. But the former Patriots head coach was only so-so in his first NFL head coaching stint (although he was a premium defensive coordinator in several stops). Carroll waited for his spot to return to the NFL, and now he’s getting control of an entire organization in Seattle. You can understand why Carroll wants to leave USC – what more can he accomplish there, and with NCAA sanctions possible, hitting the eject button now may be prudent – and he’s getting the situation he wants. But he’s going to need to do a masterful job to turn the Seahawks around. All of Seattle’s so-called stars are either aging or gone, and there just isn’t a class of premium players behind them. And Carroll won’t be able to simply recruit talent to Seattle – he’ll have to maneuver around the salary cap, the draft, and free agency. That’s not to say that this can’t work – Carroll is bright, and he knows the NFL well enough to be able to be successful. But in his search for control Carroll went to a team that’s on a steep decline. He’s getting a five-year deal, and he’ll probably need all of that time to reinvigorate the talent base and make Seattle competitive again. This isn’t an easy task for Carroll, but rebuilding USC wasn’t either, and Carroll thrived there. We’ll see if he has another miracle in him. 1 – Chan Gailey, Bills – The Bills shot for the moon by talking to Bill Cowher and Mike Shanahan about their coaching vacancy, but in the end Buffalo settled for Chan Gailey. It’s an uninspired choice, given Gailey’s so-so results as the head coach of the Cowboys in the 1990s (18-14 in two years) and at Georgia Tech. 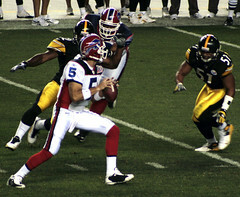 Gailey does have success as a head coach at lesser levels, and his proficiency as an offensive coordinator led Cowher to push Gailey as a candidate to Buffalo’s bureacracy. But the fact that Gailey was fired as the Chiefs’ offensive coordinator before the season makes this look like a desperation hire instead of a real choice. It’s not surprising that big names like Cowher and Shanahan avoided Buffalo, given the team’s market and financial limitations. But the inability to hire a promising new head coach like Russ Grimm or Leslie Frazier or even Perry Fewell, who had been the team’s interim coach, is disappointing. It makes it look as though the Bills are above only the dysfunctional Raiders in the pecking order of desirable NFL jobs. No other team would have considered Gailey this offseason; the fact that the Bills did does not speak well of them. In a surprising choice, the Buffalo Bills have hired Chan Gailey as their head coach. Below are some thoughts on the move; we compare it to other coaching moves this offseason in this post. The Bills shot for the moon by talking to Bill Cowher and Mike Shanahan about their coaching vacancy, but in the end Buffalo settled for Chan Gailey. It’s an uninspired choice, given Gailey’s so-so results as the head coach of the Cowboys in the 1990s (18-14 in two years) and at Georgia Tech. Gailey does have success as a head coach at lesser levels, and his proficiency as an offensive coordinator led Cowher to push Gailey as a candidate to Buffalo’s bureacracy. But the fact that Gailey was fired as the Chiefs’ offensive coordinator before the season makes this look like a desperation hire instead of a real choice. It’s not surprising that big names like Cowher and Shanahan avoided Buffalo, given the team’s market and financial limitations. But the inability to hire a promising new head coach like Russ Grimm or Leslie Frazier or even Perry Fewell, who had been the team’s interim coach, is disappointing. It makes it look as though the Bills are above only the dysfunctional Raiders in the pecking order of desirable NFL jobs. No other team would have considered Gailey this offseason; the fact that the Bills did does not speak well of them.